Who do you think of when you think of someone living with mental illness, like depression or anxiety? A friend? A family member? Yourself? How does it make you feel about that person? Different than someone who doesn’t have a mental illness? Do you feel empathy? Sadness? The desire to help? Who do you think of when you think of someone struggling with an addiction? Someone whose situation has taken on additional layers as a result of trauma? Someone whose situation has meant interaction with the justice or child welfare system? Do you feel the same connection? The same empathy? Do you maybe catch yourself being a little more judgmental, wondering how did they let this happen? Having fallen through the cracks, an individual wanting help faces more roadblocks than most of us realize. And that is also the very reason I am grateful for the work of Turning Leaf and how they work tirelessly to fill those gaps in the system. It has been over a decade since I first learned about Turning Leaf and the work they do. In that time, I have become aware of the struggles that too many face, and the success stories of so many who have benefited from the support of Turning Leaf. Turning Leaf meets people where they are. Sometimes that isn’t a great place, and it may also be a hard place to leave. But through Turning Leaf’s absolute acceptance without judgment, clients are shown the dignity and respect every individual deserves, and are never turned away. Turning Leaf works with clients, filling many of the gaps they are experiencing in their lives: through day programs, residential services and stable housing, and the personal relationships they form, building trust, self-compassion and resilience. When compassion collides with evidence-based, person-centred support, amazing things can happen; change is made possible and lives improve. May 7-13 is Mental Health Awareness Week and there is so much more we need to do to end the stigma. We can start by bringing more awareness to organizations like Turning Leaf so they can continue to do the essential work they do, and be more accessible to those who need it. Let’s start by asking ourselves what we can each do to support those who have been hit hardest and who have the most room for growth in their journey. This is what Turning Leaf does every day. 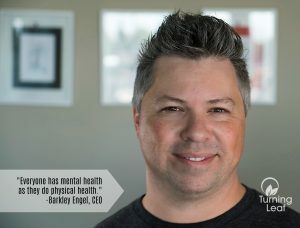 If you or someone you know is struggling with mental health, Turning Leaf is there to help. Please reach out by emailing info@turningleafservices.com or by calling toll-free 24 hours per day 1-855-221-5594.